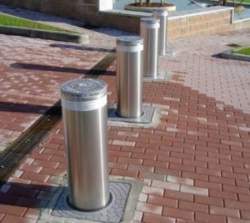 BOLLARDS product has been designed to ensure maximum peace of mind and protection for any entrance. The post, which disappears completely when lowered, is made of thick steel. During movement it is made clearly visible by the flashing warning lamps, in compliance with current safety standards. In the case of a power failure, the post can be lowered by carrying out a simple operation using the release key. Company and forwarding agent warehousing facilities industries – shopping centres – research centres embassies – police stations and military bases Ministerial buildings and sensitive sites in general.